Yet another lovely shower gel by Rogé Cavaillès. If you want to keep your skin protected and avoid the use of an invasive product, that’s a great solution. This shower gel is gentle to the sensitive skin type with its almond and rose butter. The two core ingredients prevent the skin from getting dry, keep it hydrated and make it smell of a soft, creamy rose scent. A very feminine and smooth shower gel. Here’s a lotion for daycare which nourishes even the driest of skin. The body milk is a rich liquid cream with hypoallergenic and protective qualities, so it is suitable for kids as well. If your skin is dry and а pulling feeling is present especially in the winter months, this lotion does magic! It restores the skin barrier, soaks in deeply and refreshes the skin with its thermal water ingredients. Trixera is the product to keep your skin nourished, protected and hydrated for up to 48 hours. To tell you the truth, I have never had dry skin on my hands. I rarely used gloves in winter, either. Not until now. 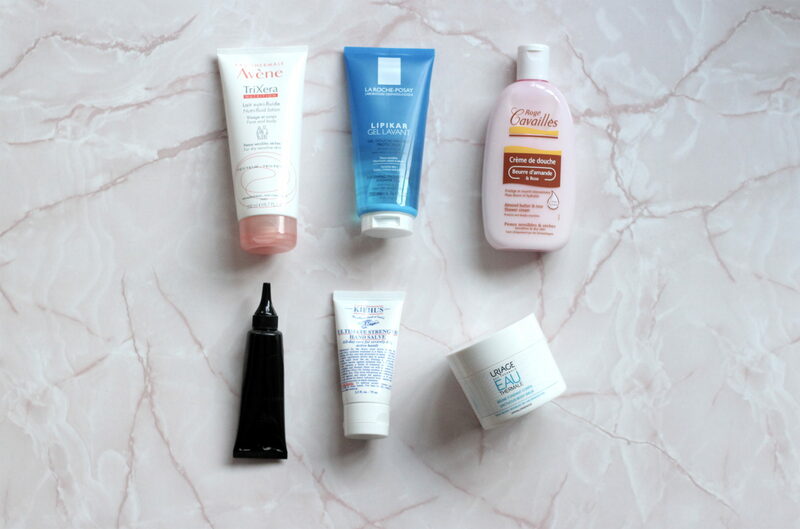 So I started experimenting with hand cream products, trying to find the best for me. Right now, I keep a Vichy hand and nail cream on my desk, but at home, I have two really great alternatives. Ones is the hand cream by Filorga. A little bit denser, it works to repair the skin and nails from dryness and aging. It nourishes intensely and even has qualities like evening out skin tone and unifying pigmentation. It’s a cream for ladies in their 30s and older. The other super nourishing option I use right now. Without a smell, this rich in avocado and sesame oils cream gives me just the protection I want. It’s a universal hand cream men should not feel shy to use it. It’s specially designed for active hands doing industrial work, manual labor or are exposed to harsh elements. Due to its “glove-like” effect, I recommend using it before bed, so it repairs your skin well. And here’s a nourishing care for the whole body. During the summer I used the lighter milk version of the product, as in winter this body butter comes in more handy! When it’s freezing outside, even with thicker clothes, your skin does not stay fully protected. The sun isn’t really here to warm us up as well. So extra nourishment after a shower is more than necessary! This product for dry skin by Uriage is perfect for the whole family. It deeply hydrates and protects the skin, absorbs in quickly and allows for a complete comfort during the day.